Bond Economics: Primer: What Limits Bank Lending? Primer: What Limits Bank Lending? The unfortunate fact that bank deposits are considered money has one side effect: our mysticism about money extends towards banking. The apparent ability of banks to "create money out of thin air" seems unfair, and this leads to questions about what limits their ability to lend. The answer is a lot simpler than one might suspect. For any other business (with the possible exception of the resource industry), output is largely constrained by their ability to find customers that they can sell their product to. The business of banks is lending. By analogy, the ability to find customers that they can profitably lend to limits their growth. In this article I assume that the reader is somewhat familiar with balance sheet concepts, and some of the basics for bank accounting. There is a series of tutorials on the subject by Eric Tymoigne. It has been awhile since I read those tutorials, and I am unsure how my discussion here relates to his arguments. My comments here may or may not fit into any accepted school of economic thought. For any business, its ability to expand is limited by its ability to attract customers that can be profitably serviced. (Some firms may decide to put profitability concerns to a side and just go for growth, but that is not sustainable.) One could argue that the resource extraction industry is in a somewhat different boat, but even there, if nobody can afford to purchase their output, the industry will have to curtail production. Banking is no different. Banks are not in the "money creation" business, they are in a lending business. Imagine that you walk into a bank, looking for a loan. You will sit down in an office with a loan officer (several loan officers if the loan request is large). There will be no discussion whatsoever about the bank's ability to extend the loan, instead the entire conversation will revolve around your plans. How much do you want to borrow? What will you do with the loan? How will you pay it back? Do you have collateral? Etc. The decision whether the loan will be extended depends upon the following criteria. Would the bank be willing to lend you the money at any interest rate for this particular loan? Are there any other banks willing to lend to you at a lower interest rate (in which case you presumably go there)? Are you willing and able to borrow at the offered rate of interest? Only point #2 (does the bank officer have the authority to make the loan?) reflects an internal constraint on bank lending; every other point either depends upon the customer, or the banks competitive position versus other banks. We can then ask ourselves: does this constraint ever show up in practice? During the Financial Crisis, banks were unwilling to lend. Otherwise, I cannot remember any other non-crisis period where we saw banks tell prospective clients with reasonably-sized loans that they are unwilling to lend to anyone at any interest rate. In other words, the only effective constraint on growth during normal circumstances is the demand for loans (by creditworthy customers at the market interest rate). The remainder of this article discusses why a loan officer would not have the authority to make a loan, and why this is generally rare. On top of capital constraints, there are concentration limits imposed on well-run banks. These limits might not exist in some countries, but they are an important feature of modern banking systems in most of the developed countries. For mark-to-market purists, the ability to keep loans at book value (modulo the loan loss reserve) is "mark to fantasy" accounting. However, it allows the banking system some ability to weather small crises. The well-known problem is that if too many bad loans pile up, the bank has to slowly crawl itself out of a known problem. You end up with what is often called a "zombie banking system," which is unable to finance growth properly. The relationship between the bond market and banks is often underestimated. Many analysts draw a sharp distinction between the two: banks create loans flexibly, whereas bond markets allegedly allocate existing funds. That misses the joy of leverage in the fixed income markets. This means that "large" debts will always be funded by the bond markets, and that the formal banking system will never extend the credit.This cannot be captured by simplified models that aggregate the banking system into a single bank (plus a central bank). If there were a single private bank, it would presumably be big enough to ignore concentration limits (except for lending to governments). The extension of concentration risk is industry risk. In practice, we tend to see capital investment concentrated in a few popular sectors. Even if an individual borrower is below concentration limits, banks could easily be highly exposed to a particular sector. (This was a common feature of earlier banking crises in the formal banking system.) The modern practice in well-run banking systems is to vent this risk onto the fixed income markets. This modern practice makes some assertions about the inevitability of repeats of the Financial Crisis suspect. One of the reasons for complacency going into 2008 is that the system worked in the telecom crisis. Although many casual observers were captivated by the bubble in the dot-com shares, the real danger was in the debt issued by the telecom industry to pay for the 3G licenses and capital expenditures. However, that risk was almost entirely borne by bond investors, and the formal banking system was not even scratched. The assumption was that this performance would be repeated gong forward. Of course, extreme risk taking behaviour overwhelmed those institutions, but one may note that the problems were started outside the formal banking system in 2007-2008. This is a related issue to concentration risk. Quaint old textbooks describe how banks allegedly operate as maturity-transformation vehicles: the borrow at a floating rate, and lend at a fixed rate. Historically, this was the case. The Savings and Loan Crisis was started off by Chairman Volcker of the Federal Reserve scrapping the social contract. By raising the short rate in a deranged fashion, we destroyed the basis of the 3-6-3 model of the savings and loan industry. ("Pay 3% of deposits, lend at 6%, on the golf course by 3.") The disinflation was not just a magical costless shift in time preferences to consumption; Volcker blew up the banking system as a means to drive economic activity to a halt. Bank balance sheets were not ready to absorb the higher interest rates. In practice, corporations want to fund large capital expenditures at a fixed rate. The only way that the bank can hedge such a risk in practice is to issue long-dated bonds (or find very large swap counter-parties). The problem is that the bank will incur long-duration debts matched against a concentrated pool of large borrowers. If any of those borrowers fail, their interest rate exposure is suddenly unbalanced (on top of the credit losses). As a result, interest rate risk exposure compounds the problems created by concentration risk, and so banks are not natural funders of long-dated fixed investment. The other constraint on lending growth is deposit loss. Even though extending a bank loan creates a corresponding deposit, the expectation is that the loan is used to buy something. Unless the seller leaves the proceeds on deposit at the same bank, the bank in question has to make a transfer to the recipient bank. Since the deposit is a liability of the bank, the bank has two options to keep its balance sheet in balance: either "sell" an asset (or transfer an asset in the settlement system) or issue another short-term liability to replace the deposit. (The proceeds of the liability issuance is used to fund the transfer.) Such short-term liability issuance could be borrowing in inter-bank market, using the repo market to borrow against existing security holdings, or issuing commercial paper. 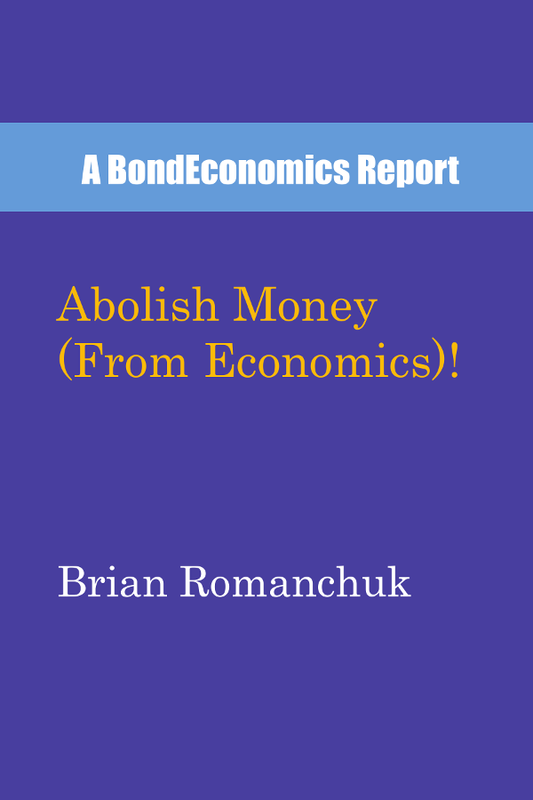 I covered this in the chapter (number 13) "No, Banks Do Not Lend Reserves" in Abolish Money (From Economics)! Profits that are reinvested in the bank is one way to grow capital; this is obviously what the regulators love to see. However, common equity can also be increased by the issuance of new equity or rights issues. (Rights issues are essentially a public auction of call options on new equity; these are more popular in Europe than in North America.) However, capital can also be increased by issuing other subordinated debt instruments (and preferred shares); this is what equity holders tend to like. Once again, capital constraints are only a short-term constraint. If the bank is growing profitably, it will be very easy to issue new capital instruments at acceptable prices. Securitisation is another way for a bank to deal with the above issues. It originates the loan, and then sells it off its balance sheet in a securitisation. The sale of the security raises cash (raising the liquidity buffer), and by reducing the risk assets on the balance sheet, reduces the capital required. The above points showed that issuance of new instruments is how a bank can grow its loan book, even if loses deposits. However, it has to pay a market rate. If it is growing too fast, sensible credit analysts should be unhappy with lending more money to that bank in the bond or money markets. The bank will need to issue debt with higher spreads, which eliminates its ability to offer loans at a competitive rate. The above argument applies to a single bank, that is growing faster than the banking system in aggregate. However, the constraint shows up on an aggregated basis. Bond investors do not like allocating too much risk to one sector, and so bank debt spreads on average could become wider versus industrial corporate bonds. This makes the banking system in aggregate less competitive versus other sources of funding, reducing the growth of bank loans. That said, they would probably just dump the securitisations on the bond market, which is a different risk bucket for bond investors. There are a number of factors that prevent the banking system extending very large loans in a short period of time. This means that unrealistic thought experiments about bank lending are technically correct: yes, banks cannot extend arbitrarily large loans right now. However, this tells us absolutely nothing about how banking works in practice: banks have the capacity to extend loans to match plausible nominal growth rates. (Hyperinflation, as always, might require a separate analysis.) It is very easy for banks to alleviate the short-term constraints on lending growth by issuance of securities, particularly securitisations. The ability of the formal banking system to grow (and lend) is partly determined by the relative size of the non-bank financial sector (also known as "shadow banks"). If everyone is allocating their cash to money market assets, it means that bank deposits are a correspondingly diminished source of financing. It would then be unsurprising that the formal banking system will shrink relative to non-bank financial entities. That said, the use of securitisations allows banks to move the financing role to the shadow banking system, and once again, there are few practical limits on plausible nominal growth rates for lending. The fact that there is some sort of natural limit to an activity does not justify the activity, or at least justify the size to which the relevant industry grows. E.g. absent taxes on alcohol, there would be a limit to the size of the brewing and distilling industry, but the number of people dying of alcohol related illnesses would be unacceptably large. Same goes (at least in the view of some countries) for gun ownership). The basic flaw in fractional reserve banking (i.e. letting private banks create or “print” money) is basically the same as the argument against letting traditional back-street counterfeiters operate: letting anyone print money is a subsidy of the printer at the expense of the community at large. To illustrate, assume an economy where there is only state issued money. Assuming enough of the stuff is printed and distributed, there is no reason the economy will not reach full employment or “capacity”. There is also no obvious reason why interest rates won’t settle down to some sort of genuine free market level. Loans would be done person to person and also via banks, just like in the real world. If private banks are then allowed to create and lend out their own money, they can undercut the latter free market rate of interest, and for the simple reason that printing money is cheaper than having to borrow it or earn it. That amounts to a subsidy of the money lending industry and the rate of interest is then at an artificially low, or “non GDP maximising” level. At this point, my normal reaction is to point out to you that the state does not have a monopoly on “cash”, which is what matters. People will just use money market funds as cash, and the money market complex is just as flexible as the banking system. All you have accomplished is driving activity from the regulated banking system to the poorly regulated shadow banking system, and the authorities will end up bailing it out. You then will respond about some blah-blah about making such lending illegal. I will then point out to you that you seem to be completely unaware of how the English legal system works (somewhat amusing since you are an English nationalist). You will completely ignore me. In a couple of months, we will have the exact same conversation again. "In a couple of months, we will have the exact same conversation again." Brian, You seem to be behind the times: money market mutual funds in the US have been forced to abide by the rules of full reserve banking. I.e. funding anything more risky than government debt must be done via what are effectively shares, not deposits / cash. Re your claims about the English legal system, I'm baffled. The advocates of full reserve banking in the UK like Positive Money have never to my knowledge spotted anything about the English legal system that makes full reserve difficult or impossible. I look forward to you filling us all in on that one. Re your suggestion that I have "ignored" your earlier points on the English legal system, I have absolutely no memory of you making such points. Can you remind me when and where you made those points? Re "it's not true I do not do forecasting", where did I suggest you don't do forecasting? I forgot to deal with your point "All you have accomplished is driving activity from the regulated banking system to the poorly regulated shadow banking system...". First, I've seen that point made and rebutted dozens of times. One answer to it was given by Adair Turner (former head of the UK's Financial Services Authority). As he said, if we are going to have bank regulations of any sort, than absolutely any entity which is effectively into banking should be regulated. As he put it, “If it looks like a bank and quacks like a bank, it has got to be subject to bank-like safeguards." And regulating shadow banks is not difficult in that some of them are now as big as the average small bank (which are already heavily regulated). As for regulating very small banks, that's not impossible either: very small building firms with three employees have to obey a whole host of regulations. But even if small shadow banks are not regulated, doesn't matter too much: i.e. regulating the largest banks, normal and shadow, cracks the problem. Moreover, it is debatable as to whether the liabilities of very small banks constitute money. Reason is this. Money is defined as anything "widely accepted" in payment for goods and services or in settlement of debts. The idea that the liabilities of a shadow bank with three employees will be "widely accepted" is a joke. For 99% of transactions done by households and small firms, the only things that serve as money are central bank issued physical money and plastic cards issued by the largest banks and credit card companies, and checks drawn on well known banks. A money market fund is a fund that invests in short-term securities. Whether you want to label it as “equity” just reflects your thinking, and has no bearing on its economic role. Turner is a crackpot if he thinks a government under English law can force activity to take prescribed forms. As soon as the ink on the bill dries, there will be financial activities that are effectively banking that will spring up, and will be found by the courts not to be covered by the law. The financial sector has better lawyers than the government. Since full reserve banking would destroy economic activity, no one with half a brain would enforce it. If you believe that the government can legally force activity to take particular forms, and only those forms, please explain why governments have a hard time enforcing corporate tax law. Brian, To label stakes in MMMFs as equity does not simply reflect my "thinking": it derives from the definition of the word equity. US MMMMFs which invest in anything more risky than government debt must now be funded via so called "floating net asset value" stakes. I.e. the value of stakes goes up and down along with the value of underlying assets much like shares in any corporation. In contrast, the value of stakes in "government debt only" MMMFs are fixed, so that's not equity. Re your claim that bank like entities will just outwit legislators, that's a problem in the case of ALL BANK REGULATION. I gave specific reasons above for thinking that form of "outwitting" will not take place above. Instead of answering those points you just repeat your claim that banks will outwit regulators. Re your claim that full reserve would "destroy economic activity" that is just plain stupid. How about giving some REASONS for thinking that, if you know what the word "reason" means? And whatever reason you come up with, I'm 99% sure I'll have heard it before, and demolished it before: I wrote a book which demolished about 40 criticisms of full reserve. Moreover, there's a clutch of Nobel laureate economists who back or backed full reserve during their life times. Having a Nobel prize does not prove the prize winner is right of course, but the idea that people of that caliber would fail to spot the possibility that "full reserve destroys economic activity" is totally unrealistic. But I'm always happy to listen: exactly why does full reserve "destroy economic activity"? Ralph, I do hot have time to waste on this again. But a few points. 1) Your “Nobel*” prize winning economists are crackpots like Milton Friedman. Friedman is like Greenspan - reliably wrong about practically everything. Citing them cuts no mustard with me. 2) in practice, full reserve banking would accomplish diddly squat. Nobody of importance would hold any cash in them, and deposit accounts would be extremely expensive. Everyone would rightly hate the idiots that destroyed low cost deposits. All the credit risk would move to the non-bank finance, and would be bailed out as a necessity. Everyone would want to know what idiots moved all financial activity outside regulation. Attempting to enforce the rules across all credit activity like the dimwits you cited would result in an attempted Sovietisation of all credit relations. It would either flee to outside jurisdictions, or cease. "Unless the seller leaves the proceeds on deposit at the same bank, the bank in question has to make a transfer to the recipient bank." And the recipient bank, ignoring other mechanisms for a moment, has to take a deposit in the source bank or the transfer doesn't happen. Which wouldn't be good for the recipient bank because they've just upset their customer who was expecting to be paid. The funding source happens automatically because the transfer mechanism is ultimately a closed system. It can't go anywhere else. If the transfer happens, the funding happens because it is at its core just an exchange of positions. Transfers don't really shrink bank balance sheets. They can't in pure form because you're not getting rid of the loan. When you throw a central bank in the mix, there is a 'loan' you can readily transfer (reserves), but it's just an accounting illusion really. This is a discussion for a single bank. I discussed the overall system in my earlier text. "However, it is possible that even if you bump all the way up the hierarchy, the bank cannot give you the loan due to size issues." I think this is in practice correct. In theory I think the bank can seek additional capital etc. if there is an attractive enough loan proposition on the table. So there is no theoretical "size issues". I of course agree with your assessment about deposit creation being driven by loan demand. Yet I'm interested in how do you see factors of this demand, especially what is the role of general (what ever it means) interest rate level vs. significance of banks' margins, especially deposits vs. loan rates? Also even if this might be an off-topic but could you please comment what do you think about Mike Sproul's version of real bill doctrine as a value driver for the deposits? In practice, it is hard to see that banks would be able to attract the amount of capital to take down corporate bond issuance, and follow existing concentration limit rules. This depends on the level of the fragmentation of the banking system; the Canadian banking system is dominated by a few large banks, and thus it would be easier for them on a relative basis. In any event, we do not see banks attempting to do this is practice, and so as a practical matter, corporate bond lending remains largely outside the formal banking system. Loan demand in particular depends on institutional structure; if it migrates to the shadow banking system, we will see less loan growth. But credit growth in particular is a nominal growth story, along with real estate trends (the major driver of loan growth now). Nobody in the real world cares about interest rates, in less they rise a lot (e.g. early 1980s style tightening). I’d have to look up Mike Sproul’s work; never ran across it yet. "Nobody in the real world cares about interest rates, in less they rise a lot"
Thanks Brian, and very much agreed. Check out Sproul if you have time. I find him work very interesting and I think it mostly agrees with the tax driven value story. "In practice, it is hard to see that banks would be able to attract the amount of capital to ... "
Bank capital unfortunately refers to both the quality of assets in the loan portfolio (Basel capital controls are efforts to measure the risk-weighted asset mix) and to the level of equity and other liabilities that take the first loss in a write-down of bad assets. In the aggregate bank system the balance sheet increases when any bank lends or spends money to a nonbank making an increase in transaction deposits and aggregate bank assets. Next the bank must clear payments after the expansion event and would lose reserves to other banks. So as Brian describes each bank must attract "sticky" deposits and other money market borrowings by paying interest to creditors to keep from selling down assets to make interbank payments. So this moves deposits from checking (transaction accounts) to time and saving deposits and to money market borrowings in the aggregate system. Next the bank needs to attract equity investors which means the aggregate bank debits (decreases) a deposits liability and credits (increases) equity. So the "source" of bank expansion is lending or spending to nonbanks and then banks borrow back funds by paying interest or issue equity by cancelling deposits previously created by lending/spending. The equity investors are motivated by dividends and/or sustainable growth of bank assets with profits that increases the market price of shares over time. Banks are self-capitalizing and self-funding as long as the risk-weighted asset mix is not so fowled up that it causes a "run" away from the bank by creditors and equity investors. This is true whether or not there are "regulations" imposed on the risk-weighted assets and other balance sheet ratios - but regulations might improve bank stability compared to a totally unregulated industry. Originate to distribute was a strange model in the United States. The banks would create loans and deposits then bundle the loans and sell them to nonbanks for a fee. This increased earnings for the banking sector, increased equity capital held as retained earnings without increasing the bank balance sheets, and eventually led to a bunch of bad loans bundled for sale to the nonbank financial sector in a game that I call "pass the trash". Some banks had promised to buy back bad loans from nonbanks and during the financial crisis Fed may have had to assist some large banks that could not expand their balance sheets to buy back bad loans without losing confidence from depositors and equity investors at the same time. This was part of the so-called bailout. Dear Brian, since you mentioned the relation between Banks and the Bond Market, do you know if it works the same way when it comes to the sovereign market of, say, the Eurozone? What are, briefly, the actions that take place in the Primary Dealers' balance sheets in this case? Buying up a new sovereign issue does not expand their balance sheet ? I would have to look, but not sure if the euro area uses the “primary dealer” designation, given the fragmentation of the sovereign market. If the banks buy the government bonds by running down settlement balances, their balance sheet would be unchanged. However, I think the usual outcome is that they borrow from the central bank or the private sector in the repo market. In that case, they issued a liability to fund a position in a new asset, which grows their balance sheet. Since the risk weighting for a bank’s sovereign is 0%, and government bonds are liquid, they do not hit capital/liquidiy constraints. Of course, most of the issues will then be sold on to end investors. They will then let their repo financing roll off. Primary dealers do exist, I for a fact know that the Bank of Greece appoints several big banks as such. The mandates do differ a bit compared to the PD system in the US and the market is indeed fragmented, therefore PD's are not necessarily the same in every eurozone country. I was wondering whether there was a difference, specifically with the Eurozone, because evidently government bond issues are not merely reserve drain / interest rate maintenance tools in this case, but now that I think of it and given your response, there should not be a reason for it to work differently. The ECB has a different pattern of operations, certainly. But so does the Bank of Canada (no reserves) and the Fed (reserves). Too busy index-linking to refresh my memory. But from a practical persoective, it just juggles the names of instruments used, from the private sector perspective, the economic effect is similar. We need to be like financial engineers, and look at the economic function of instruments, and not worry how they are labelled. Far too much expert analysis worries about labelling, not realising that the private sector entities themselves trade these products based on their economic function. Euro sovereigns are using PDs. I think once PDs/lead-managers were able to underwrite and buy a significant amount of primary emissions on their trading books. But now due to heavy regulation rounds it is not profitable anymore. Quote: "If everyone is allocating their cash to money market assets, it means that bank deposits are a correspondingly diminished source of financing. It would then be unsurprising that the formal banking system will shrink relative to non-bank financial entities." Comment: I have a paper on SSRN called Sources and Sinks of M1 Money in the US Financial System. In this paper I show why investments in money market mutual funds (MMMF) do not necessarily force the aggregate bank to reduce its balance sheet. What happens is the retail depositor sells a $1 deposit to purchase a $1 dollar share in an MMMF. The banks move the deposits from the retail depositors to the MMMFs as deposit assets. I am fairly certain that when the banks are expanding assets they will do repurchase agreements on the bank liability side with the MMMF money managers. Therefore the traditional stories told by many economists, including monetary economists, are just wrong: money market investments reduce retail deposits but are not a drain on bank funding sources. Questions: I do not understand the assertion that banks and other financial firms can collectively insure against interest rate risk. Does the risk shift to a non-financial counter-party or evaporate into thin air? In other words is this a zero-sum game in which the hedge party shifts risk to speculators or is it a positive sum game in which risk is assumed to be eliminated? 1) I might need to go back and re-read what I wrote, but I was focussd on bank loans in particular, and not bank balance sheet size in aggregate. Banks can almost arbitrarily lever up their balance sheet by financing positions in the wholesale money markets - like everyone else. However, that does not affect the size of the loan book. 2) Banks just dump the interest rate risk onto institutional investors. The supply of duration is matched to the demand for duration. If institutional investors do not want to take duration risk, nobody will get long-term fixed financing done. There’s no need to look at the details, that’s the final economic result that will always happen. Banks only took duration risk in earlier eras because there was trust that the central bank would not act in a deranged fashion. After Volcker, everyone knows that the central bank may be deranged, and so excessive duration risk is verboten.